About the author: Cyci Cade is blogger and writer; she writes urban fantasy and fiction novel for young adults. She´s a contributing writer in the Southern Writers Magazine. She´s the author of Dragon´s Curse, and short stories like Perhaps Love, The boys and the Dragon, Son of Egypt. Blurb: Two princes from the Dragon´s Dynasty, Liu and Wei, are cursed and condemned to live as dragons because they failed in their duty, to protect the Dragon Empire. After two centuries their fate changes when Kate appears in their lives and they are able to return to their human form. However, the curse isn´t broken yet, they can´t survive without the dragon´s side. To break the curse, the princes must recover the eyes and heart of the Great Dragon. As Liu, Wei, and Kate embark on a journey to the Palace of Jade in search of the first eye, they´ll have to face mythological creatures and the immortal warriors. They´ll have to face death too, and prove that they are honorable men to save Kate´s life. They´ll be tested as never before. They´ll discover feelings they never imagined existed. They´ll have to fight like wild warriors. If you like mythology, dragons, and romance, you must read this book! Three lives, separated by time and land, connected by a curse. The plot is, two centuries ago, the Great Dragon transformed two princes, and their family in dragons. But everything started when the princes were born during an attack to the Dragon´s Empire. The midwife, the only person who knows who was born first, dies during the attack. Emperor Shun must choose one of his sons to take the throne. It´s a hard task. Being unable to choose one of his sons, he decides that the best one will be the next Dragon Emperor; the princes have to prove their value and it creates great animosity between them. Liu and Wei fight for anything to get the throne and become the Dragon Emperor. They´ve been living as dragons for two centuries, but everything changes when Liu meets Kate. After that encounter, the brothers are able to return to their human forms; they have opportunity to mend their mistakes and break the curse. However, it won´t be easy. They have to face many dangers and mythological creatures; their first stop is in the Palace of Jade, a mythological place protect by immortal warriors and mythical creatures. Liu and Wei have many unfinished business and their relationship reaches an unbearable level when they fall in love with the same girl, Kate. Cyci Cade weaves a wonderful mythological world with the real world. The book is full of action that takes you forward and leaves you wanting to read more. Ending a chapter it´s hard to control the urge to start another one because you want to know what will happen. Set in China and USA, this is a story full of adventure. The characters are so vivid and full of emotions that transport you to the fictional village Dragon´s Valley in USA and the mythical Palace of Jade in China. It is easy to imagine and describe those creatures. You feel a connection with the characters. I usually read two or three chapter a day. 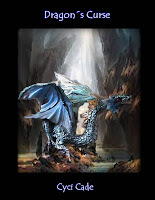 Reading Dragon´s Curse, I couldn´t stop, I read four, five chapters a day. I´m eager for book #2. Cyci Cade offers a tantalizing fantasy story filled with awesome moments of joy, romance, and hope and chilling moments of fear and despair. She takes you by the hand and leads you through unexpected paths. It is impossible not to laugh and cry reading the book. It is about love and redemption. It is about the search for forgiveness. It is about the search for happiness. A family was destroyed and its destiny is in their hands. To accomplish their tasks, they have to put aside their differences, trust each other, fight hard their enemies and dark emotions. The writing is compelling with a plot that grows constantly and offers new adventures, obstacles to overcome, and many twists and turns. It´s impossible to predict what comes next. I recommend the book. Pictures from Cyci Cade´s blog.